The Oxford is the most basic and timeless of the dress shoes, and a great starting point if you’re looking for a classic staple. They are a versatile option that can be dressed up with formal wear or down for a more casual arena. Gaining its name from its history at Oxford University, oxfords were a newer version of the popular Oxonians that were popular at the university circa 1800. This half-boot style was — at century’s turn – judged outdated, and students began looking for an alternative style. 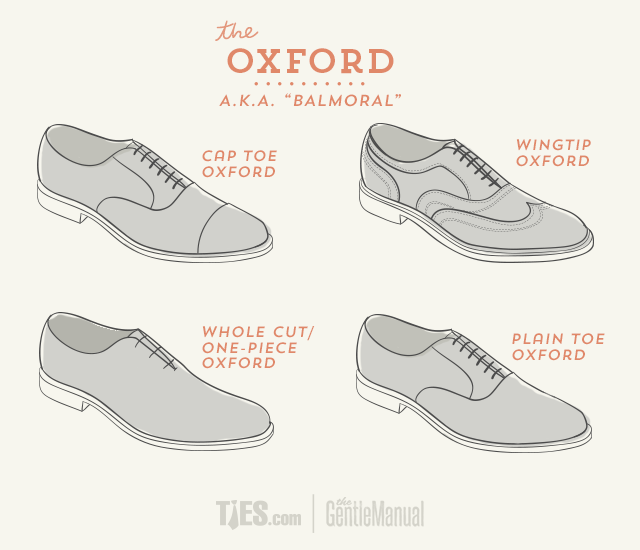 The oxford shoe was the fulfillment of longings for something modern. The shoe is characterized by its facing being stitched under the vamp. This is called “closed lacing.” The facing’s placement provides a slim silhouette that hugs the foot’s contour. It is on account of its minimalism (and ability to go with just about everything) that the Oxford enjoys its popularity. For general everyday wear, there are many colors from which to choose, in both leather and suede. For business attire, dark brown, cordovan, English tan, and black leather are your safest choices. If you’ll be pairing them with a tuxedo or other formal wear, black patent leather is your best bet. The One Piece Oxford is a variation on the classic oxford, constructed of a single piece of leather rather than various pieces sewn together. This style has only one seam connecting the piece of leather to the back of the shoe while maintaining the original oxford shape and signature “closed lacing.” The limited stitching gives a sleek and sophisticated look that adds to the shoe’s simple, no-nonsense style.